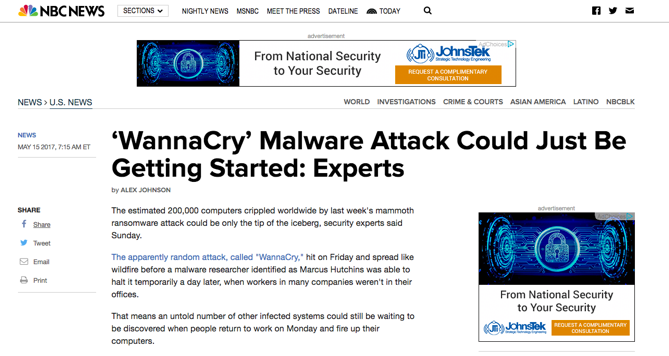 By now all of our readers have heard about the “WannaCry” ransomware virus that attacked across the globe in epoc proportions last week. Everyone that manages a network should be concerned about the continuing growth of this virus. As reported by many news outlets, the “WannaCry” attack continues to grow, now affecting over 150 countries and shutting down networks all over the world. New Alert: To compound the threat, another ransomware virus is starting to grow, “Jaff”, AKA “Locky”. It could reach the same level of attack as WannaCry. At a price of $3,700, Jaff’s ransom demand is much higher than its predecessor. The . Jaff Virus ransomware is capable of encrypting a large variety of different file types on the victim’s machine.